State Representative Jim Lyons (left) and GOP gubernatorial candidate Scott Lively. State Representative Jim Lyons couldn’t have a better antiabortion record — a cause for which he and his wife, Bernadette, have fought for years. 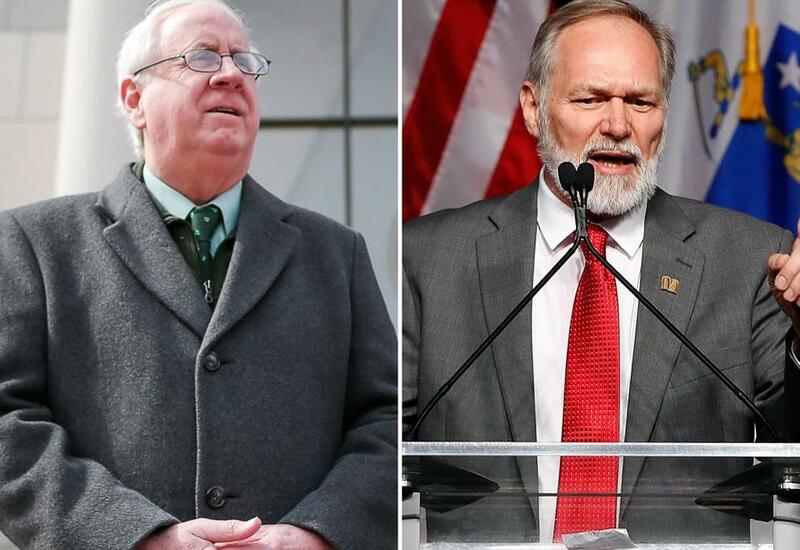 But he had no idea his endorsement of Governor Charlie Baker, who backs abortion rights, would spark a nasty flurry of e-mails from Baker’s GOP primary opponent, Scott Lively. The spat came to a head last week when Lyons barred Lively — after initially inviting him — from his reelection kickoff. According to e-mails between the Republicans, that move prompted Lively to threaten to go nuclear on him publicly if the Andover lawmaker did not “distance” himself from Baker and remain neutral in “any future attacks’’ the governor makes on him. That threat from the Springfield-based pastor, who has a reputation for highly controversial statements on social issues including gay rights, didn’t sit well with Lyons, a four-term lawmaker with considerable conservative credentials. Those tough exchanges came after Lyons’s campaign sent invitations to his reelection kickoff in Andover last week. When Lively returned a pleasant “Dear Jim” response to inform Lyons he would be attending, the four-term GOP legislator moved quickly to tell him his invitation was mistakenly sent and he was not invited. Lyons was still burning over an e-mail that Lively sent in late April, just before the state Republican convention. “Planned Parenthood Thanks You, Jim’’ was the subject line. “For joining with Charlie to share in their sin. I’m ashamed of you,” read the message signed by Lively, which Lyons showed the Globe. But, when he got the invitation to Lyons’s campaign kickoff two months later, an emboldened Lively, who had emerged from the convention with a surprising 28 percent of the delegate vote against Baker, was singing a different tune. Lively told Lyons he was ready to donate to his legislative reelection campaign and planned to attend. “I have always admired your steadfast stand for the babies even while those around you have abandoned them for political expediency,’’ he told the lawmaker via e-mail. But Lyons, who was still smarting from the April e-mail, had had enough. He told Lively not to show up, saying it was a mistake he got the invite. Lively thentried to say he was for reconciliation. “This rebuff is a second slap in the face and evidence you have no remorse about your conduct,’’ Lively told Lyons in a June 19 e-mail. A few days later, in another e-mail, Lively warned Lyons there was a time limit of a week before he attacked him publicly for his endorsement of a pro-abortion-rights candidate, Baker. Lyons was far from backing down.